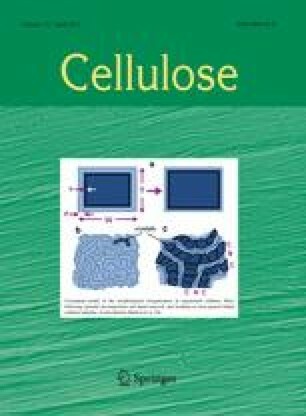 A family of polysaccharide based scaffold materials, bacterial cellulose/chitosan (BC/CTS) porous scaffolds with various weight ratios (from 20/80 to 60/40 w/w%) were prepared by freezing (−30 and −80 °C) and lyophilization of a mixture of microfibrillated BC suspension and chitosan solution. The microfibrillated BC (MFC) was subjected to 2,2,6,6-tetramethylpyperidine-1-oxyl radical (TEMPO)-mediated oxidation to introduce surface carboxyl groups before mixing. The integration of MFC within chitosan matrix was performed by 1-ethyl-3-(3-dimethylaminopropyl)-carbodiimide hydrochloride (EDC)-mediated cross-linking. The covalent amide bond formation was determined by ATR-FTIR. Because of this covalent coupling, the scaffolds retain their original shapes during autoclave sterilization. The composite scaffolds are three-dimensional open pore microstructure with pore size ranging from 120 to 280 μm. The freezing temperature and mean pore size take less effect on scaffold mechanical properties. The compressive modulus and strength increased with increase in MFC content. The results show that the scaffolds of higher MFC content contribute to overall better mechanical properties. This research was supported by Japan Society for Promotion of Science (JSPS) under the Grant-in-Aid for Scientific Research (Grant number16004160) and RISH-Mission project (2007 fiscal year), Center for Exploratory Research on Humanosphere, Research Institute for Sustainable Humanosphere, Kyoto University. The authors would like to acknowledge Prof. Yamanaka from Shinshu University for a gift of Acetobacter strain used in this study, and Prof. Isogai and Dr. Saito from The University of Tokyo for their guidance to conduct conductimetric titration.